July 11, 12, & 13-Fifth Mid-East Festival. June 29-Fifth anniversary of groundbreaking. Celebration of the Divine Liturgy outside by the pond. July 10, 11, & 12-Sixth Mid-East Festival. November-Fifth Anniversary of the Dedication of Our Lady of Lebanon Church and Sharbel Center. June 7-First ever Blood Mobile at Our Lady of Lebanon. July 9, 10, & 11-Seventh Mid-East Festival. 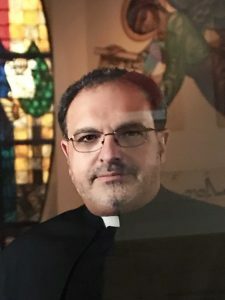 September 18-Gregory John Mansour, first parishioner from Our Lady of Lebanon to be ordained a Maronite priest at St. Michael Church in downtown Flint, by Bishop John Chedid. September 19-Father Gregory celebrates First Liturgy of Thanksgiving at Our Lady of Lebanon. October 30- Father Anthony Salim becomes our fourth pastor. October 31-Celebration of the Divine Liturgy for Father Dave as he leaves and Father Anthony as he arrives. June 24-Father Anthony Salim tenth anniversary of ordination as priest of the eparchy of St. Maron. July 13, 14, & 15-Ninth Mid-East Festival. September 23-30-Renew program starts. Renew is a parish program carefully designed to help people follow Christ more closely. 1984-Silver Massabki Medal awarded to Mr. Norman Abdella. January 27-February 3-2nd Semester of Renew. February-Silver Massabki Medal presented to Don Paliani. July 12, 13, & 14-Tenth Mid-East Festival. Summer 1985-Up-stairs classrooms and library added in memory of Gloria Mansour. September 21 & 22-3rd Semester of Renew. November 17-Beatification of Sister Rafka Al-Rayes by Pope John Paul II. Our liturgy on this day was for Blessed Rafka and all Christians in the Middle East. March 15-Fourth Semester of Renew. July 11, 12, & 13-Eleventh Mid-East Festival. September 20 & 21-Fifth Semester of Renew. October 16-House of Representatives Washington D.C.-Honorable Dale E. Kildee of Michigan pays tribute to Our Lady of Lebanon Maronite Catholic Church on the Tenth Anniversary of its consecration and dedication. November 7, 8, & 9-Tenth Anniversary of Dedication of Our Lady of Lebanon Church and Sharbel Center. 1986-Silver Massabki Medal awarded to Mrs. Shirley Gazell. July 10, 11, & 12-Twelfth Mid-East Festival. September 19-Papal Liturgy at Silverdome, Pontiac, Michigan by Pope John Paul II. 1987-Silver Massabki Medal awarded to Mrs. Sue Adado. July 8, 9, & 10-Thirteenth Mid-East Festival. 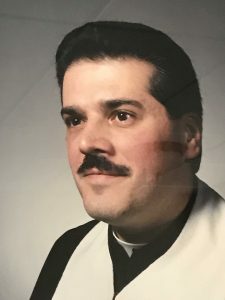 November 3-Father Anthony Spinosa becomes the fifth pastor of our parish. April 14-Certificate of Appreciation issued by Clara Barton Terrace Convalescent Home to Our Lady of Lebanon for valuable contribution. April 14, 15, & 16-Regional NAM Convention held at Our Lady of Lebanon. July 14, 15, & 16-Fourteenth Mid-East Festival. 1989-Silver Massabki Medal awarded to Mrs. Mary Ann Sheehan. December 24-Dedication of Our Lady of Lebanon Shrine in the mediation garden.